I love Niels Bohr. He is my favorite physicist. When Einstein famously said that God doesn’t play dice with the Universe, Bohr replied “Einstein, don’t tell God what to do”. I love Einstein as well, of course. I have two Einstein posters in my room. One where he says: “Great spirits have always encountered violent opposition from mediocre minds. The mediocre mind is incapable of understanding the man who refuses to bow blindly to conventional prejudices and chooses instead to express his opinions courageously and honestly” and the other: “Imagination is more important than knowledge. For knowledge is limited, whereas imagination embraces the entire world, stimulating progress, giving birth to evolution.” So who better to try to disprove Quantum Physics than Einstein himself? Here, we have one of the greatest indictments against those who oppose competition. Bohr and Einstein had a series of public disputes about quantum mechanics. Their debates are remembered because of their importance to the philosophy of science. Obviously Bohr and Einstein had a mutual admiration for one another, even though they disagreed. Here is proof of competition and cooperation working together to advance mankind forward exponentially more than ever before. At the end, after years of trying to disprove quantum mechanics, Einstein finally gave in. Bohr had won, and suddenly everything scientists thought they knew fell apart. To be aware of this and still be against competition is similar to still believing in communism after reading Solzhenitsyn’s Gulag Archipelago. It is not even worth discussing. So how does the Werron article relate to all this? The interesting part of the Werron article is when he brings up the effect of the audience on competition. It is similar to the idea of the observer in quantum mechanics. 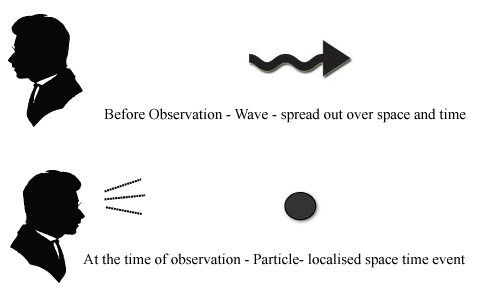 The observer effect is the theory that simply observing a situation or phenomenon necessarily changes that phenomenon. As ibetracer points out, Werron–like any good German scholar–is very thorough in his research, which gives his work an objectivity that is missing in Hutcheon and Bateson. We learn from Werron that effects of competition vary depending on the kind of audience. Pierre Bourdieu’s field theory suggests that some kinds of competition like news and journalism are criticized for their homogenizing effects, while in science and arts are equally acknowledged for their productive and creative effects. I decided to take Einstein’s advice and voice my opinion courageously and honestly on this matter. What I got from this is that news and journalism can get away with lying. How can the audience know if the news is telling the truth or not? That is why propaganda exists, why Nazi Germany was able to do what it did, and why we have what we call “fake news” today. Because the audience can’t check the truth, competition between different news stations doesn’t help the field of journalism, but instead creates a bunch of lying propaganda spewing machines. On the flip side, in mathematics, science and arts, the audience cannot be lied to with much success. Mathematics are easily proven or falsified, similar to science. If you are lying you will be found out quite easily. Arts may seem a little more tricky, but with a big enough audience, good art always rises to the top. You can see this with the fall of audiences going to movies, while TV is back with a bang. Movies are too concerned with making money, and using their medium for propaganda as well, and thus competition has created similar terrible movies. When one penguin movie comes out from a studio, another studio comes out with another penguin movie. Because of this, and combined with all these new streaming channels, all the proper creative minds have turned to TV. They don’t have to sellout their artistic ideas just to make it “big”. Netflix, for example, is giving so many different shows a chance and thus creativity can flow again. Art touches our instincts and our subconscious. Storytelling has been happening for thousands of years, from as far back as anyone can remember, probably even during caveman days. It is very hard to be a hack in art and get away with it. What does all this mean when it comes to competition? We can find our answer, oddly enough, if we take a closer look at rats. Rats like to play fight. But what has been discovered by Neuroscientist Jaak Panksepp is that they PLAY FAIR. When rats play fight, they try to pin the other down. That is how a rat wins the fight. If one rat doesn’t win at least 30% of the time, that rat will stop playing with the other rat. There is something intrinsic that lets them know that it is not fair and they go on and play with a different rat instead. This seems to work amongst humans as well. Competition helps the individual people and humanity as a whole, when everyone involved plays fair, and cooperates in the common goal. Einstein really didn’t want Bohr to be right, but because they had principles that were above winning, and were both seeking the more accurate truth, they got along and at the end Einstein had to admit defeat. What better way to prove the truth than that? I really appreciated your unique response to Werron’s article. It was fantastic how you made that connection of competition, as a concept, to Bohr and Einstein. You provide examples of how competition have different effects across different situations by juxtaposing the case of broadcasted media with knowledge within the field of mathematics. This is intriguing to me as it causes me to consider what the significant differences between these situations are that result in positive versus negative effects of competition. To reiterate, it is interesting to think as to why competition is beneficial in certain scenarios but detrimental in others. However, I think it is important to consider who’s perspective we are taking into consideration when weighing the benefits and drawbacks to competition. Perhaps within the field of academia, competition serves as a mechanism to reinforce cross-validation, whereas for broadcasted mass media, we see that information received by the masses is distorted. However, on the flip side, aren’t there people or groups that benefit from the blurred mass media? This is something I think is worth thinking about. You mention that rats like to compete within the boundaries of fairness. But, does this really apply to humans? I’m not sure what my answer would be, but it’s an interesting thought to explore. It is interesting that you have brought up the quantum debate between Bohr and Einstein and noted that they had competing theories and at the end Bohr’s argument prevails. As another perspective of it linking back to the notion of competition, quoting from Werron, is to have an audience for performance. Certainly, the correctness of a proposed theory can be a type of performance, but in my opinion, it should be the scientist’s, or in Bohr and Einstein’s case, the physicist’s best guess at what the truth is. There is a predetermined “win” and “lose” as there is only one fact, much like what you have mentioned about mathematics. The “winning” of Bohr also does not come from the expense of Einstein’s reputation or knowledge, but rather promotes the greater good of society. It perhaps, in my opinion, doesn’t fit Werron’s definition of competition, but maybe it is another form of cooperation in play. Perhaps it is another form of competition that does not have a “zero sum” like Kohn proposed. It is interesting to look at competition in multiple prospects even within disciplines. The fact that the word competition, while framing a general idea of two parties competing for scarce resources, can have such a diverse interpretation across disciplines is fascinating. Thank you for your thoughtful reply. I personally think competition in academia has lots of drawbacks, and isn’t always related to competence in the field. I have bounced a few alternatives in my head, but I still have not run across a better way that isn’t just abstract like when people speak of having a “classless” society. On the subject of rats, what I am alluding to is that, if rats, with their small brains have a instinctual understanding of the concept of what is fair, then humans have a more developed concept of fair play built into them. Now if we ignore it because of what we consider more important(ie. money, fame, ambition, ego) that is another matter. It’s kinda ironic that between these two physicists, where if one theory is correct, then the other is incorrect, which is the truest definition of a zero-sum game, that if we look at it from a different prespective it isn’t a zero-sum game at all and that in fact society, so everyone, is a winner because of it. makes you wonder if it is competition we should be talking about, or something else? something like a level of human decency when being in a society with other people. When you walk through a door, take a quick glance behind you and keep the door open if there is a person, instead of ignoring them. be someone who lives with principles, and doesn’t try to gain an advantage in life through the misery of others. these kind of things, if we do those, there probably wouldn’t even be a question of competition.